Matsés traditions, sustainable art and GPS ancestral mapping. 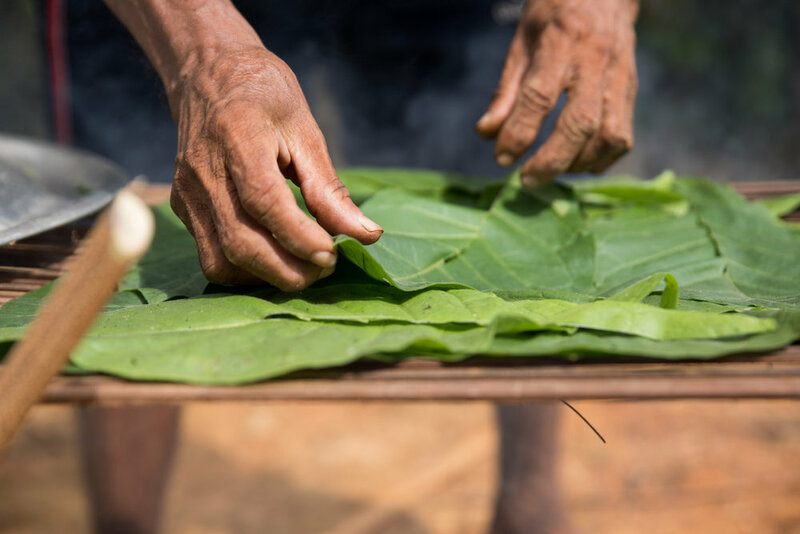 Following our first report where we introduced Matsés culture, our work and the projects working alongside the NGO Acaté Amazon Conservation (Acaté), we now explore more Matsés traditions and ancestral practices, from their hunting origins to their use of tobacco. 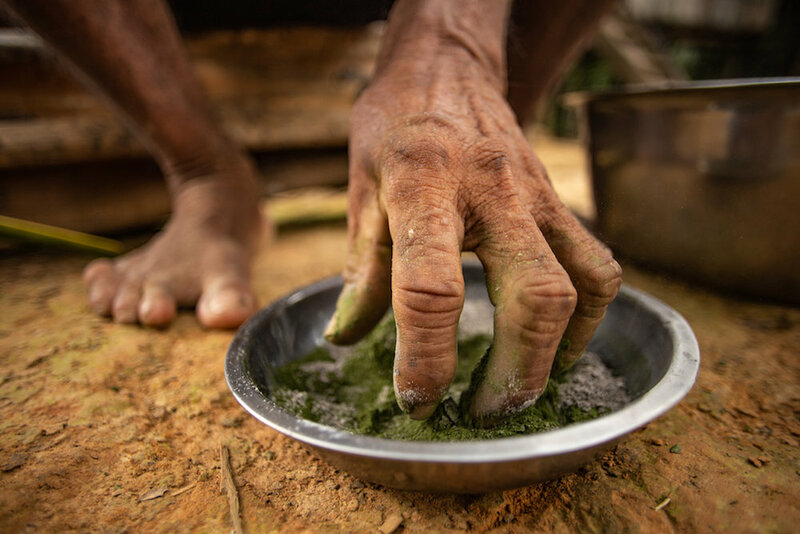 We (Xapiri) are dedicated to long-term work with the Matsés and Acaté, the aim is to ensure these ancestral practices continue and flourish into the next generation. While at the same time offering sustainable economic opportunities to the communities in relation to the fair-trade of their traditional arts. Arrow making is an art passed down through ancestral memory, later in this report we follow the full process. ‘Acaté' is the name of the NGO (Acaté Amazon Conservation) who we and the Matsés work with but the organization was named for the word in the Matsés language for a large and poisonous tree frog found throughout the northern Amazon. The acate frog (Latin name: Phyllomedusa bicolor) plays a key role in Matsés culture, through hunting ceremonies and also its history in Matsés mythology, showing how they learnt to hunt, below is an elder’s account of the legend. Daniel Bai - Matsés elder. 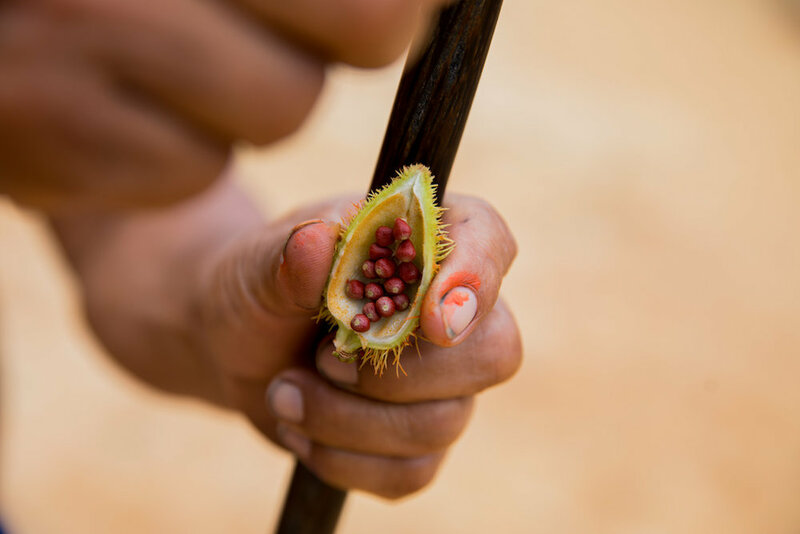 Acate which is also known as sapo or kambo has been traditionally used by the Matsés for generations. 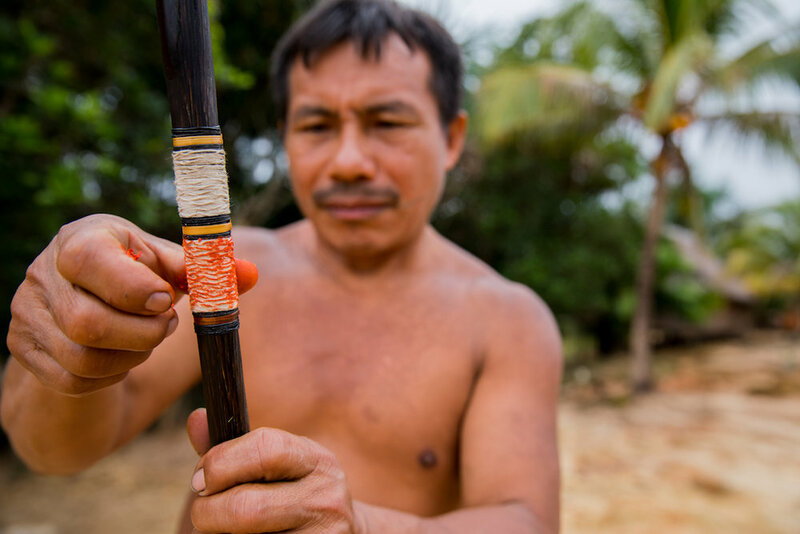 This jungle tradition is generally practised by Matsés men in order to improve their hunting prowess and strength. The acate is generally taken on rainy days as the energy and marksmanship is expected to be long-lasting so the benefits of acate are for future hunts when the weather is dry, and also for having energy for other types of work. Acate also has a role in knowledge or skill transmission, for example, if a hunter is down on his luck for a period of time on bringing back game, he will ask one of the best hunters to apply acate venom to him. The frog which is easy to find due to its distinctive voice is tied and stretched out onto a quickly made rectangle frame. 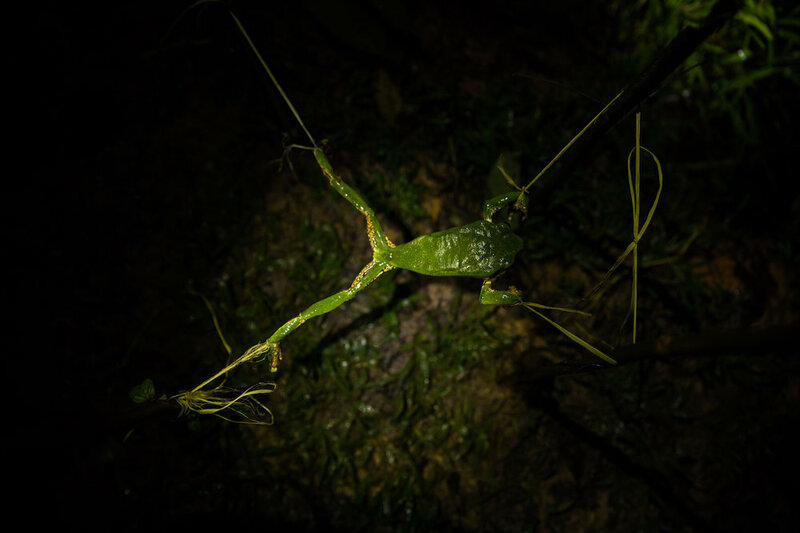 After some minutes of aggravating and disturbing the frog with small sticks, the frog in defence produces a sticky secretion through the skin, which is collected and stored on a carved stick for future ritual use. The frog is then released back to jungle, unharmed. The secretion of the frog is most commonly applied to superficial burns on the arm or chests. The effects are strong, the poison enters the body and a short-lived but intense heightened heart rate struggle and intense feeling of discomfort follows, often inducing strong vomiting. Thereafter the short-term effect is weakness, and the Matsés generally rest in a hammock to recover for a few hours. If it stops raining, they might go do some work in the afternoon. It is on the following days that they expect to have the stamina and focus for hunting. Mixing the frog secretion with saliva to form a glue-like substance. David (13 years old) receiving his dot from his grandfather Daniel. A handful of regional Panoan Amazonian ethnic groups including the Amahuaca, Katukina, Kaxinawá, Kulina, Yawanawá, and Marubo also use this frog species for similar practices in their cultures. It should be noted that in recent years the use of the monkey frog venom (known as sapo or kambo) outside of indigenous cultures has risen tremendously in correlation with the wider use of all rainforest medicines in places as far as off as Miami and London. 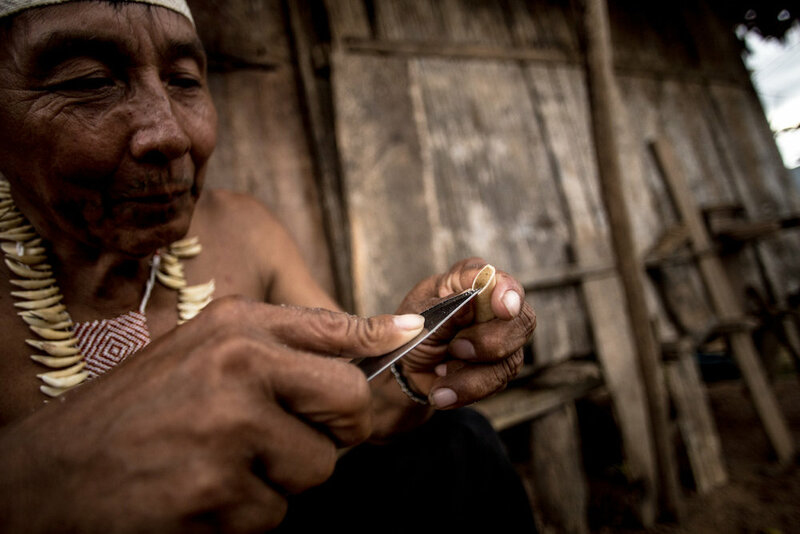 For the Matsés, the use of acaté outside of their culture has caused internal conflicts due to the unregulated sale and also the general Matsés view that part of their culture is being taken with little recognition coming back to its origins. Additionally, peptides have been patented from the frog secretions, without Matsés permission or acceptance. Antonio Manquid , Matsés Elder. 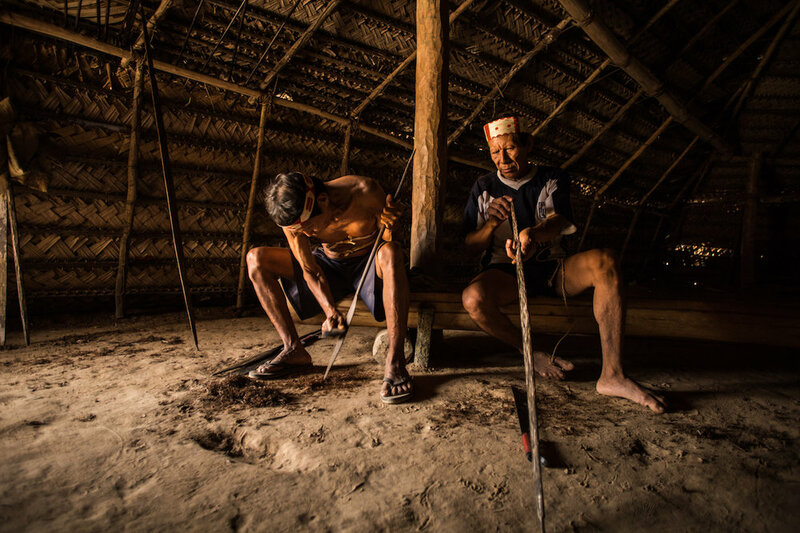 Ancestral hunting practices throughout the Amazon are quickly disappearing as knowledge is forgotten and shotguns replace traditional hunting tools. Game is becoming harder to find in the nearby jungle next to settled (non-nomadic) communities and additionally there is a rise of packaged food entering indigenous villages. 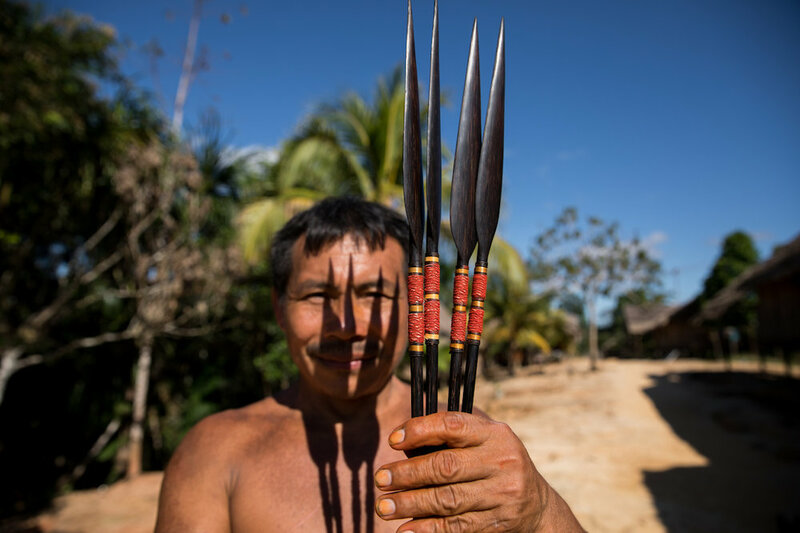 The Matsés unlike many other ethnic groups in the Amazon still use traditional hunting tools, most noticeably the bow and arrow. Shotguns have largely replaced the traditional method but for specific animals, noticeably birds and particularly the tinamous (partridge-like birds), the arrow is still the preferred choice. We now follow the incredibly fine and detailed artistic processes behind the bows, arrows and lances. The Matsés are well renowned for their arrows, reaching 2 metres in length, they are amongst the finest produced in the Amazon. The arrow shaft is made from the flower stem of the arrow cane (Gynerium sagittatum). The process begins by fletching the arrow: the vanes of a feather are removed form the rachis and each half is attached to the arrow shaft using a complex adhesive made from a mix of several types of beeswax and rubber latex. The feather is secured to the shaft using the thread-like veins of banana leaf petioles. The most common feathers used are black, taken from the curassow bird but other bird species are known to be used, such as black and white feathers from the harpy eagle and the all-black feathers of vultures. Strong bamboo points are carefully shaped with a machete, before it is attached to the arrow shaft using beeswax once more. Cotton thread is wrapped tightly over the joint for a solid and strong attachment, ready to handle rainforest hunting. Finally the arrow point is painted with annatto, the designs painted on the arrowheads correspond to the clan of the owner. The Matsés have two patrilineal clans: bëdibo ‘the jaguar clan’ and macubo ‘the caterpillar clan’, and each has 3-4 clan-specific designs that are used on arrows and headbands. Bows are usually made from various species of strong but flexible palm wood. The bowstring is made from twisted bark of a type of Cecropia tree. 2 metre lances are traditionally used in defence of the jaguar during unexpected jungle encounters. Today, they are more commonly used as a ceremonial and status object rather than in jaguar defence. The peach palm (Bactris gasipaes) is felled and the hard outer layer of the tree trunk is used to make the lance. First the wood is cut to size and then shaped by carving out the soft white pith. It takes a full day of carefully reducing the wood before it takes the shape of a lance. Once shaped, home-spun cotton thread is wrapped around the shaft and painted with the pulp of annatto berries as decoration, this is close to the spear head to be used for grip. They sand the spears (and bows) with dry leaves of a tree (Pouroma sp.) whose leaves have a rough underside, similar to fine-grained sandpaper. With fresh leaves of this same tree that have a finer grain they pass over the spear to give a shiny finish. Antonio Nëcca also makes replicas of the full-size lances. To support this fair-trade and for all art enquiries please get in touch to learn of our current stock. Antonio learnt how to make these artefacts from his father, an example of how the ancestral transmission traditionally moves. Now it is he who is teaching his children and passing down this ancient craft to the next generation. In Matsés villages it is generally only the elders who have the knowledge to make these artefacts. 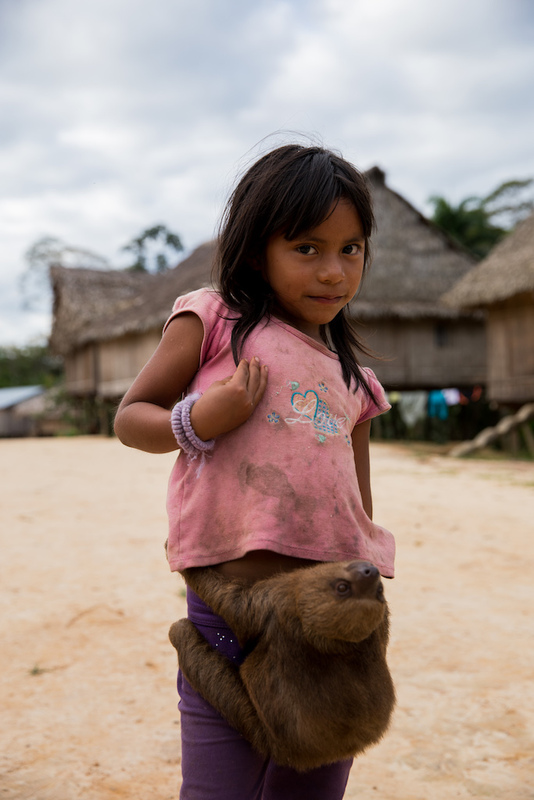 The reality today is that very few young Matsés take interest in learning and continuing these practices. It is our mission for this ancestral transmission to continue, by offering support and motivation to the younger generation when learning from their elders. 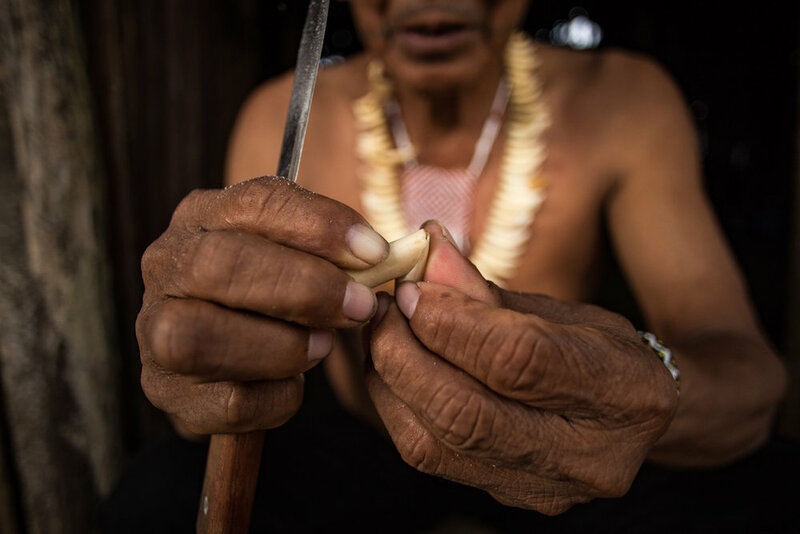 As with all of our fair-trade with the art, the selling platform through the Xapiri project provides sustainable economic options to the Matsés. In part 1 of this report series we showed home and chakra life in the villages. 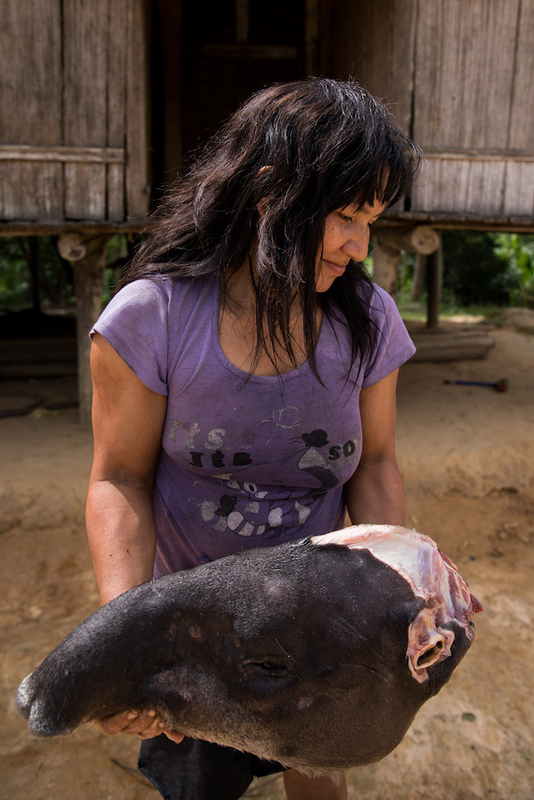 To supplement their staple diet of plantain, corn and manioc the Matsés fish and hunt, relying on their encyclopedic knowledge of rainforest ecology and honed hunting and fishing techniques. Children playing and practising with mini bow and arrows, a common sight in the villages. The modern hunters; Matsés youth preparing for a hunting expedition, shotguns, football tops and a pink bag. The Matsés hunt a wide variety of rainforest animals; primarily tapirs (donkey-sized mammals related to the rhinoceros), peccaries (reminiscent of wild boars), deer, two-toed sloths, armadillos, woolly monkeys, spider monkeys, howler monkeys, saki monkeys, uacari monkeys, capuchin monkeys, pacas (beagle-sized rodents), agoutis (smaller dog-sized rodents), curassows (similar to wild turkeys), guans (chicken-sized birds), trumpeters (terrestrial birds that travel in flocks), tinamous (partridge-like birds), wood-quails, and caimans. Being egalitarian people the Matsés after a successful hunt will traditionally share the meat with their next of kin. Fish supplements the jungle meat with the Matsés recognising over 100 species, including wolf-fish, hatchet fish, dog-toothed fish, knifefish, armored catfish, peacock bass, piranhas, freshwater stingrays, and electric eels. Fishing today is more commonly exercised with hook and line but they also have an ingenious method using a toxic plant. This plant known as chiun in Matsés (huaca in local Spanish; Latin: Cliabadium remotiflorum) is used to intoxicate the fish causing them to jump in and out of the water allowing for the Matsés to simply net the flying fish. This toxin soon leaves the fish returning them to normal and sparing the fish that are too small to eat, unlike the more toxic barbasco vine commonly utilized to poison streams in the Amazon. There are always plenty of pets in the villages, orphans of hunted animals which Matsés children happily take under their care. Sloths, monkeys and birds are amongst the most common but many other animals are also adopted. 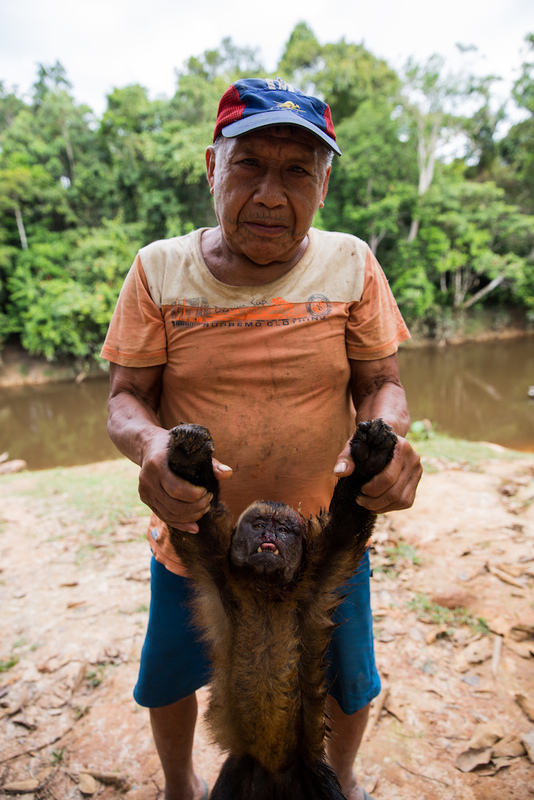 In our first report we looked at the ‘Healing Forests’ project Acaté Amazon Conservation and the Matsés have been working on, a second and as equally important project is the mapping of Matsés ancestral territory in Peru, an approximate 1 million hectares. Before the Matsés Indigenous Mapping Initiative, the only maps of the Matsés territories were created by and for the purposes of national governments or extractive industries. The maps contain vast blank areas on the map punctuated by small dots representing the current politically-recognized settlements. Only the largest rivers are named, in Spanish. 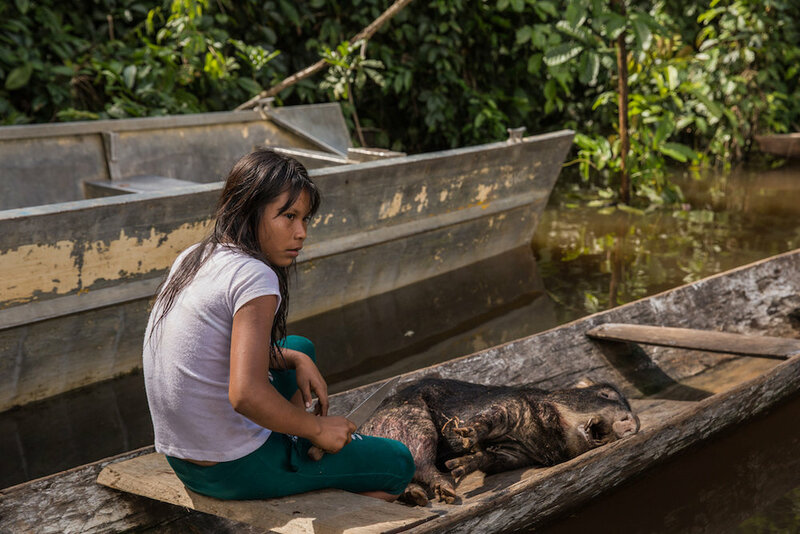 This is not how the Matsés, the original inhabitants, and caretakers of these lands, view or understand their rich and vast ancestral landscape. 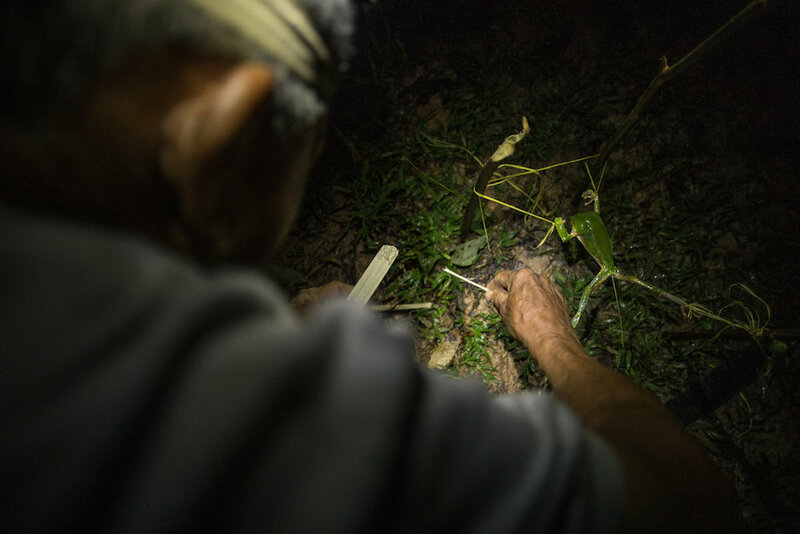 In this initiative, the Matsés are creating for the first time maps of their lands in their own language, recording the names of their rivers, cultural and historical landmarks including ancestral villages and burial sites as well as many other areas of vital ecological significance such as secluded mineral licks called mactac that attract game animals and birds. 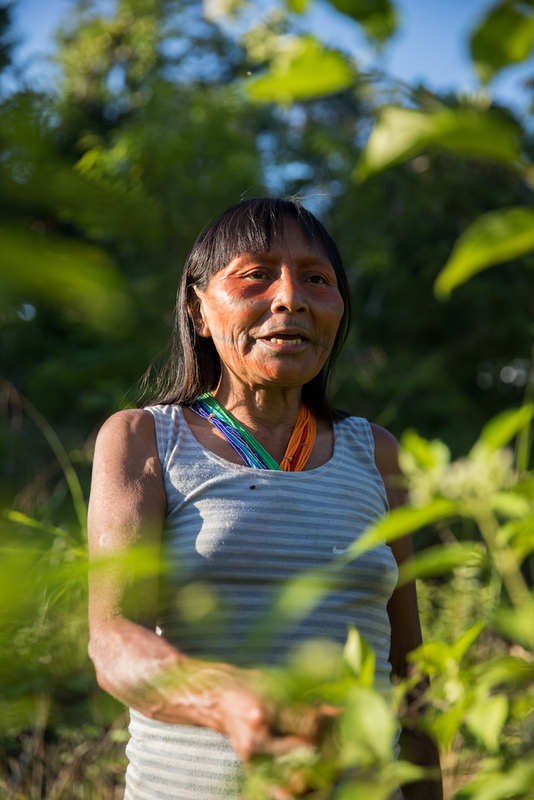 With the Matsés having their own maps that define the true boundaries and utilization of their traditional territory, they are better able to protect their land from outside encroachment. It is a sad reality today, that just a few short decades since the initiation of sustained contact with the outside world, most of the Matsés youth know only the recently given Spanish names of the rivers. 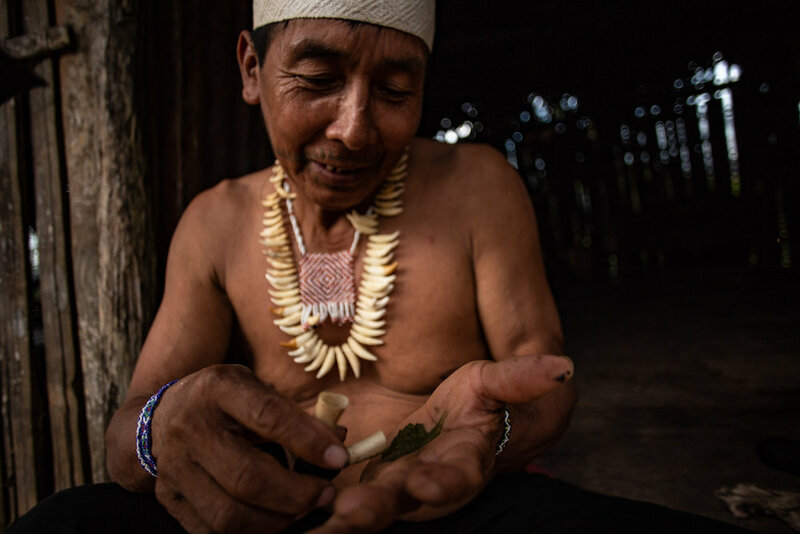 Prior to the GPS Mapping project, much of the Matsés ancestral knowledge of their lands rested only in memories of the elders. Mariano, Felipe and Segundo, 3 Matsés employees of Acaté working on the mapping. Felipe (centre) leads the project, having learnt the software through training workshops. 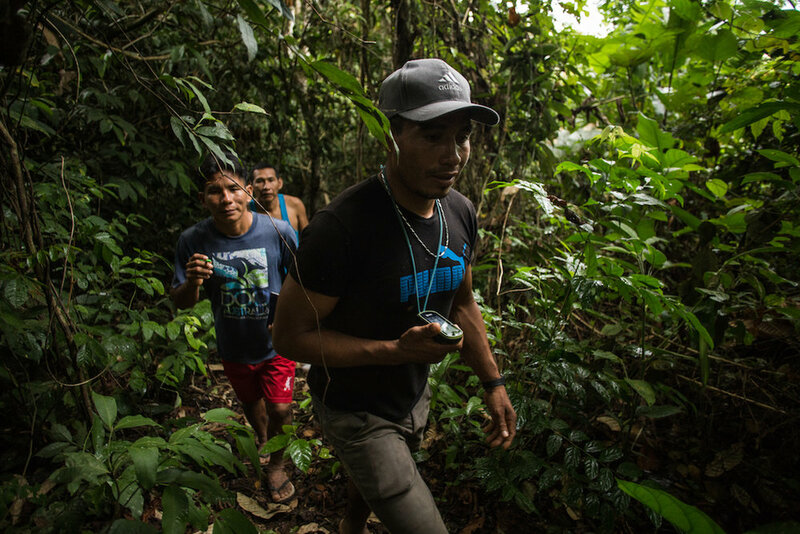 Felipe uses his GPS tracker to mark Matsés territory and sites of historical and ecological sites important to the Matsés culture. 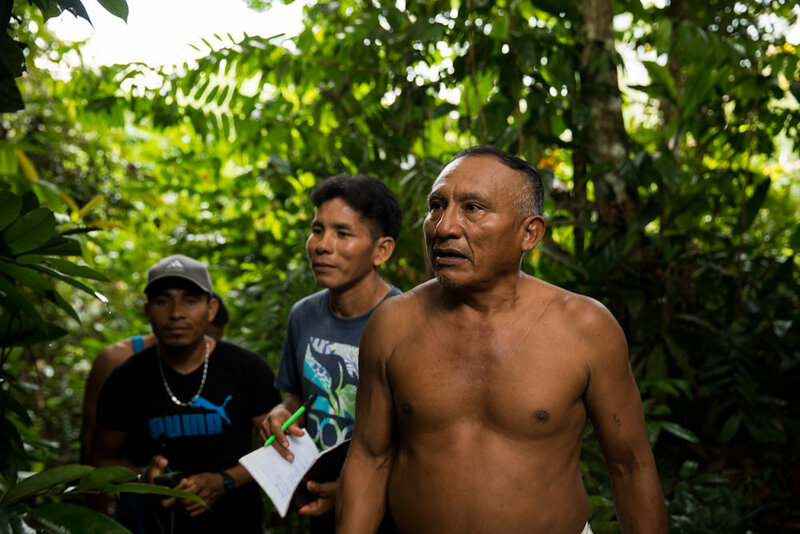 The mapping involves Matsés elders such as Antonio who transmit their territorial knowledge to the younger Matsés. David W. Fleck, Ph. D. is the field coordinator for Acaté and also a leading expert on Matsés culture having first encountered the Matsés 25 years ago. An accomplished linguist who once turned down a faculty position at a prestigious university to live with the Matsés, he has published almost 30 scientific publications on Matsés language, culture, and ethnobiology. Ultimately, he married a Matsés woman and is now the proud father of two young boys. He lived full-time among the Matsés for a decade, farming a small chacra and living a traditional jungle lifestyle. 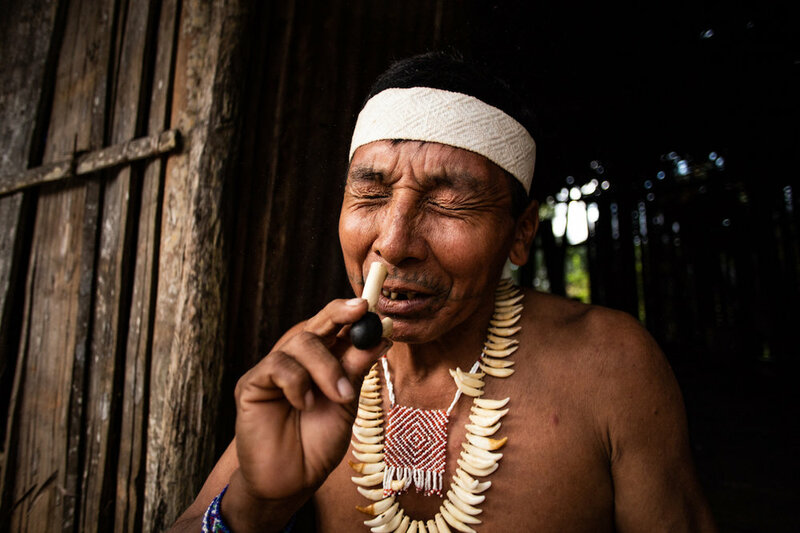 We asked David to contribute to our blog 'Eyes on the Amazon' and the result is a fascinating and refreshing piece titled 'Matses Cultural Preservation and Biculturalism' - we highly recommend a read! We also asked David to elaborate some more on the GPS project and how this acts as an example of how two cultures are meeting and working together, transmitting ancestral knowledge, 21st century style. 'Indigenous mapping initiatives involve training residents to use GPS receivers and to record data in notebooks for generating maps of their territory boundaries and localities of cultural, historical and ecological significance. It’s a good thing, but it’s not new and has been done for decades with other indigenous groups. Acaté’s innovation to the methodology was to try teaching Matses to use computers and cartography software to process the data and produce the maps themselves. They had never used computers before and the cartography software being particularly complex, we naturally expected that they would only learn enough to get an idea of how one produces a map, and that in the end we would have to make the maps for them. The Acaté Amazon Conservation / Matsés / Xapiri team. Front row from left to right; Mariano, Felipe Ëpë Bai Unan and Segundo Shabac Reyna. Back row from left to right; William Park, Tui Anandi, Christopher Herndon, David W. Fleck, Mike van Kruchten and Jack Wheeler. Nënë is the Matsés word for tobacco and was traditionally used in powdered form most days but now not so frequently. Like other cultural practices, since outside contact in the 1970's, traditional plants and medicines are used less and less. Nënë has various uses, from supplying energy in the jungle or as a tool to open conversation, tell stories and pass on oral knowledge. In a tobacco snuff form, it was also used for transferring an elder man's energy, courage and marksmanship to a younger man using a tube fashioned from a small species of bamboo. Uesnid canite is the Matsés name for the curassow bone which they use to make a pipe and inhale the nënë. The pipe is made by joining two leg bones of the curassow bird together at a 45 degree angle. Chambira fibre is used to tightly tie the bones together before beeswax is added on top for a strong moulded hold and seal. Jorge Shabac, chief of Buen Peru village and master 'uesnid canite' maker. Daniel is one of many Matsés elders who still produce and use nënë but like many other ancestral practices it is rare for the younger generation to be engaged in nënë tradition. 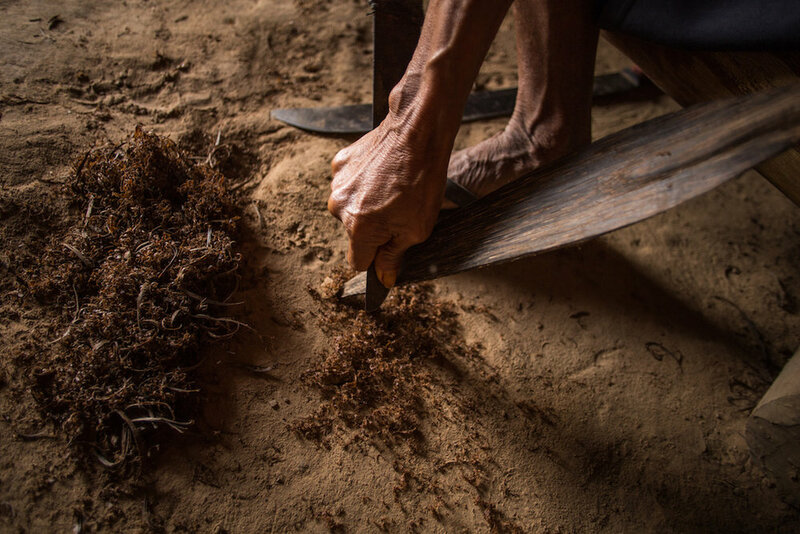 We documented the whole process with Daniel, first going to his chakra to collect the tobacco leaves which he harvests 4 times a year, giving sufficient time for the plants to replenish. On route back to the village he collects bark from a species of wild cacao tree (called senad dëbiate in Matsés, cacahuillo in local Spanish; Latin Theobroma subincanum), which will later be burnt, with the ashes added to the tobacco snuff. The ash has no physiological effect alone, but functions to release the alkaloids from the tobacco, making its effects quicker and more intense. The central veins are removed from the leaves before being placed on a readily made frame above an open fire. 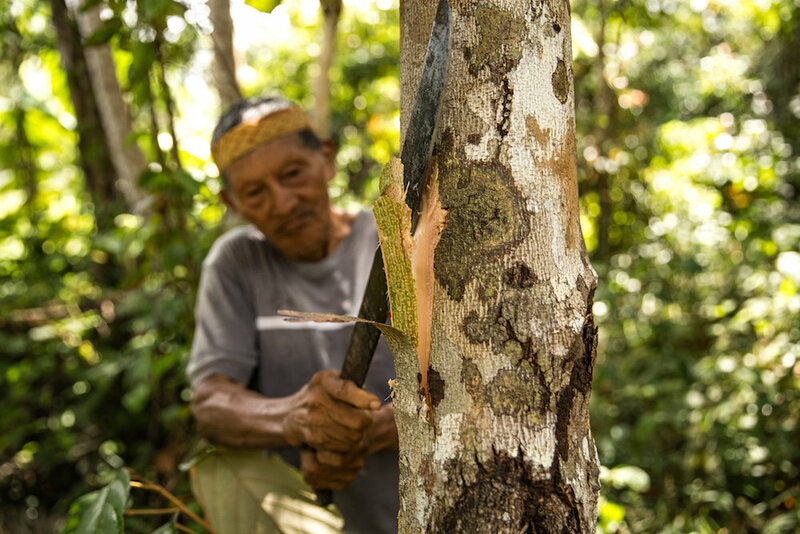 The carahullio bark is also added on top to dry alongside the tobacco leaves. 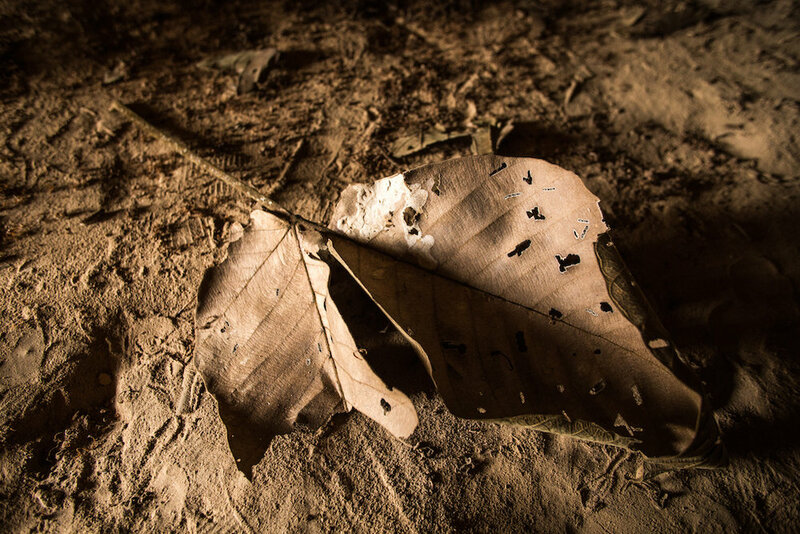 The leaves are now crumbled and mixed by hand with the ashes of the cacauillo bark. 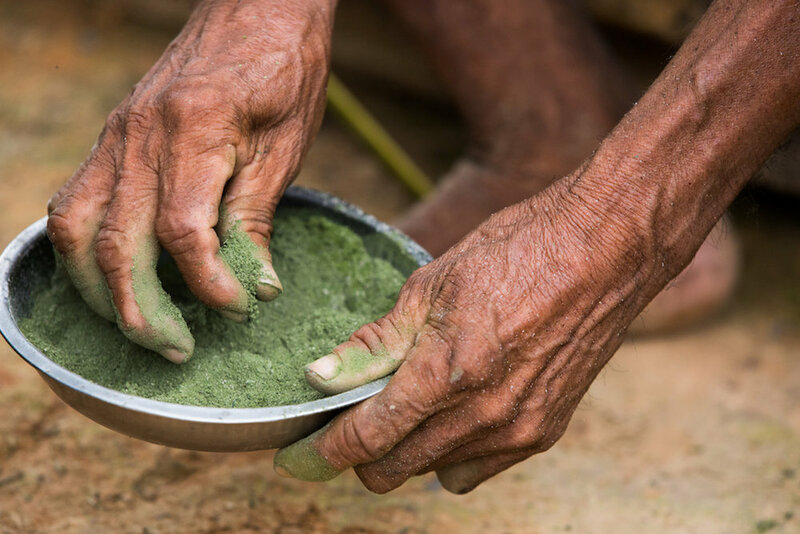 Finally the powder is put in a bamboo mortar before being smashed repeatedly with a wooden pestle until the powder is in a fine form. The final step is to sift the snuff to remove any large particles. Support the Matsés elders with buying a jar of nënë, fair-trade in its most valuable and enjoyable form. Support Matsés artists by buying here. For other art enquiries, please email us here. Thank you for reading and getting immersed in Matsés culture! We are proud of our work alongside the Matsés and Acaté, seeing long-term and sustainable models with the projects working successfully - by working together and with the support from you, this ancestral memory will live and the Matsés will continue to protect their vast territory in this remote and pristine corner of the Amazon rainforest. Shortly we will publish our third Matsés report where we will look deeper into the importance of fair-trade, explore more ancestral transmission artistic processes and alternative economic projects. Please stay connected at our website and social media channels. Thank you to Acaté Amazon Conservation; Christopher Herndon, William Park and David Fleck for making this happen and being part of a memorable expedition. For all the Matsés who warmly welcomed us and to Segundo Shabac Reyna and Felipe Ëpë Bai Una for navigating the rivers and keeping it all together.